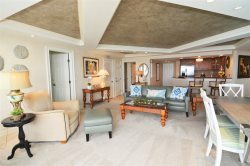 Looking for Sanibel Harbour Resort and Spa condo rentals with newly renovated Euro-style kitchens and bathrooms? This unit has been fitted with new cabinets and granite countertops, a large refrigerator with bottom-stacked freezer, a modern glass stove, and tile throughout. The living room was updated in Fall 2014 with all-new furniture highlighting a relaxing seaside theme. A large flatscreen TV in the living room and flatscreens in the bedrooms provide entertainment when you're simply spending the day indoors. In the master bath, a tiled shower with separate tub is provided. For longer stays, the walk-in closet in the master will accommodate your personal belongings. There is a king bed in the master with two twins in the guest bedroom. And last but not least, enjoy the beautiful beach and Gulf views from the screened-in balcony. If you can appreciate a good sunset, you'll love to vacation at our Sanibel Harbour Resort and Spa condo rentals. We couldn't have imagined a better stay. The condo was clean and beautiful, with every possible need thought of in the kitchen. We especially enjoyed the amazing view from this condo and hope to come back again sometime. The ease of check-in (key in a lockbox) was appreciated as we arrived after a long day of travel and were eager to go in and relax. Thank you for attending to every detail. We have rented many condos in different areas, but never have we been in one that was so totally equipped to make our stay so comfortable and enjoyable.